Turning back the clock, before fast forwarding it, comes Giovanni Damico as G-Machine. An audio alumnus of Cosmo Vitelli and Daniele Baldelli comes a new a virtuoso of space boogie. Buckle up, destination: Primo Contatto. Across eight tracks the Italian astronaut traverses the sounds of the cosmos. Warbling reverberations introduce "Flying Objects", with thick bands of synthesizer throbbing in its veins. The ultra slick "Contact" follows. Electrofunk bars float beneath stratospheric synth. Styles co-mingle. Patrick Cowley melts with Afrika Bambaataa. Disco Magic meets Tommy Boy. An overarching groove permeates the album, a heady funk that courses through tracks like "Body on the Ground" and "Transmission". The moon based mirrorball sounds flex and flow, "It's A Shame" cutting floors with sleek vocoders and addictive analogue riches. If you're waiting for re-entry think again, there is no return ticket. 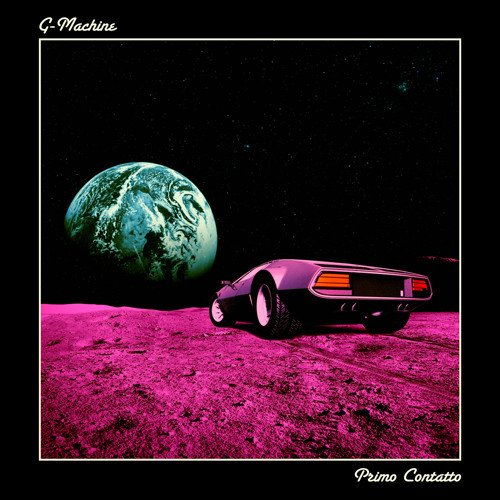 G-Machine will only be taking passengers further and further on his cosmic odyssey with tracks like "In My Arms" and "Boogie Down". Buck Rogers in the 25th century breakdowns and rollerskate goodness from needle drop to the run-out. Out mid June on Bordello A Parigi (BAP044).